Two autonomous satellites are expected to be launched tonight aboard an Atlas 5 booster from Cape Canaveral, Florida. 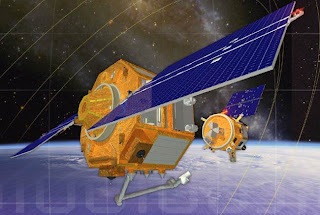 The satellites were built for the Orbital Express program to test autonomous refueling and repair of satellites in orbit. The ASTRO, for Autonomous Space Transport Robotic Operations, is a 950 kg (2100 pound) robot with extra tanks of fuel and a 3.3 meter arm for catching and holding other satellites. The second satellite, NextSat, is a 223 kg (500 pound) prototype of the next generation on-orbit serviceable satellite. The two satellites will work together to test the autonomous navigation as well as procedures and standards for space repair. The tasks will include refueling with hydrazine and exchanging batteries. The test mission is scheduled to run for 90 days. The Orbital Express is a Defense Advanced Research Projects Agency (DARPA) program with Boeing as the lead integrator. 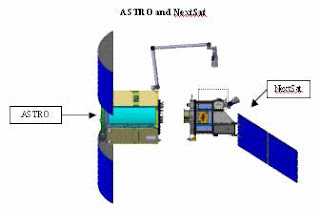 Boeing built the ASTRO and Ball Aerospace built the NextSat prototype.